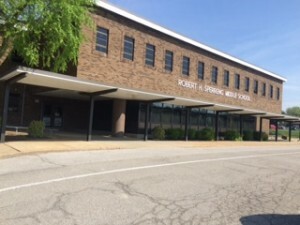 The front of the Sperreng Middle School building is on Tesson Ferry Road, Highway 21, as seen in the photo on the left. Enter the campus parking lots from Concord School Road. See campus map below. Driving directions are shown with red arrows. Drive parallel to Highway 21 along the front of the school. Pass the end of the building to the far lot which will put you closest to the cafeteria entrance. Walk down the driveway along the back of the building to the lower level. You will see some picnic tables on your right in front of the cafeteria entrance. See photo below. Enter the cafeteria through the double doors. 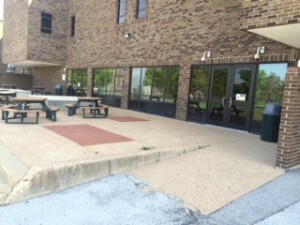 Picnic tables and doors to the Sperreng cafeteria. Drivers can drive to the entrance doors to the cafeteria to drop off a passenger, in front of the cafeteria doors. They drive down along the back of the building on the one-way drive. After letting off passengers, drivers will continue around the building on the one-way drive to circle back to the parking area along Highway 21. The walk from the parking to the cafeteria entrance is very short. See green arrows on map below. The map below shows driver drop off route with pink arrows. The shortest route to the cafeteria? Answer: directly through the cafeteria doors in the lower level. Not only is it the shortest walk from the parking lot, it is the easiest route. Coming through the building from some other door could be confusing. There are no signs to the SCHS meeting to guide you. 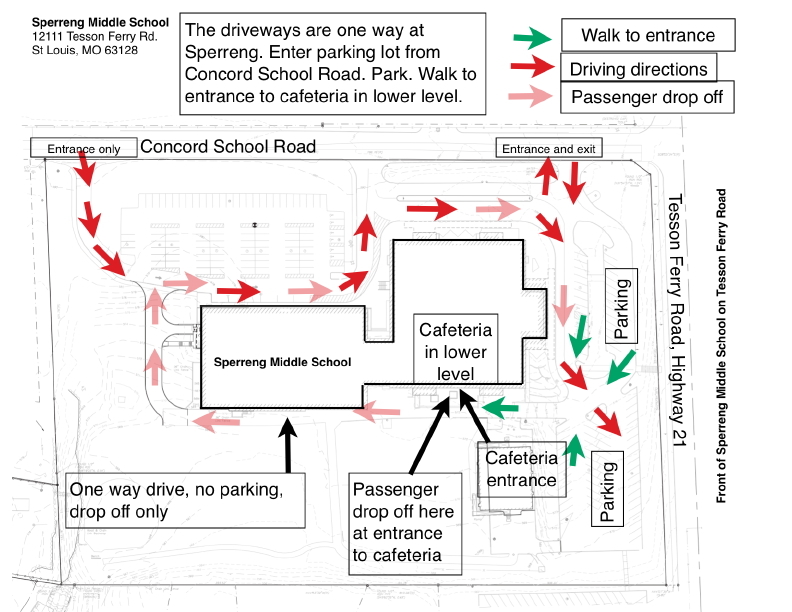 Below is a map of the Sperreng campus showing parking and the way to the cafeteria. April 26, 2016 in SCHS Events.